When Keith Hawks (BSME ’64, MSME ’66, PhD ’69) was a Purdue mechanical engineering student 50 years ago, administrators dreamed of adding a wing to the school’s building. Now, a doctoral degree and long tenure on the engineering faculty later, he is preparing to retire. And as he does so, the School of Mechanical Engineering will at long last get its wing. Hawks’ Eye: Keith Hawks, professor and assistant head of mechanical engineering, before the rising wing of the Mechanical Engineering Building. 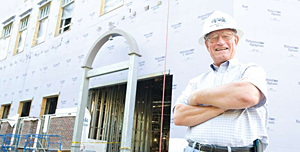 The Roger B. Gatewood Wing, now under construction, is slated to open for classes in the fall of 2011. Hawks, assistant school head, has been on board with the project since its inception in 1999 when he became chair of the planning committee. In that role, he drove the project from the initial academic program statement of need through the design phase with the architect and on to details including a personal touch in the atrium area. He has seen the project move from dream to reality as excavation gave way to a steel-beam skeleton and by this fall had risen to its full height. At 50,000 square feet, the new three-story wing — the first LEED-certified Purdue building constructed to environmental standards set by the U.S. Green Building Council — will almost double the school’s space. It will hold offices for faculty and graduate students, as well as much needed design and fabrication space for student projects and a biomechanics laboratory. Senior projects are now shoehorned in wherever there is space; they are built in hallways or tested at the football stadium. The new facility will include a 120-seat classroom and a large project instruction room. An abundance of flat screen panels will allow the use of cameras to record what is happening in one space and project it to another room or over the Internet. Hawks, a history buff, is especially pleased that the new wing will contain a special element relating to the school’s historic ties with the railroad industry. Metal spacers in the floor along the south wall of the atrium will outline a railroad track. A time capsule containing objects related to the school’s history will also find a home in the new wing, sealed into a wall by the entrance during the building dedication in 2011.